Another new product from DAEWOO PRECISION INDUSTRIES of South Korea, shown at the IDEX 2003 expo in the United Arab Emirates. 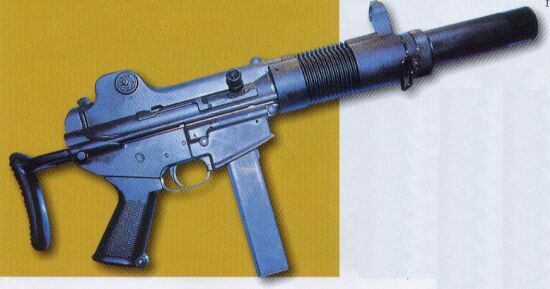 The DAEW00 K-7 is an integrally suppressed submachinegun: there are not many weapons of this kind currently existing in the world, and, with the international situation asking for an update of the arsenals of the specialized counterterror units, such items are more and more wanted by this kind of personnel. The K-7 submachinegun uses both the frame and the wire telescopic stock of the previously existing and still produced .5'56x45mm DAEWOO K1/K1A/K1A1/MAX-1 assault carbine. The K-7 fires the .9x19mm-Parabellum ammunition, feeding from any standard 30-rounder or 32-rounder magazine such as the ones used by the israeli UZI or italian BERETTA PM12 submachineguns, and fires from the closed bolt position, works with an internal hammer, and fires single shots, 3-rounds borsts or full-autofire. It weights 3,4 Kilograms, unloaded; its Rate of Fire is one of the highest I have ever heard of for a gun of this category: from 1050 to 1250 Rounds Per Minute. It has a total lenght of 788 Millimeters. The integrally suppressed barrel is very similar to the one used in the most famous integrally suppressed submachinegun in the world, the german .9x19mm HECKLER&KOCH MP5-SD5, with two side-by-side expansion chambers equipped with metal deflectors.